There are always new products in development for the Spider Dreams line of games and accessories. Here's where we'll preview them, and offer trial versions of the products in development. There are two upcoming products for October. 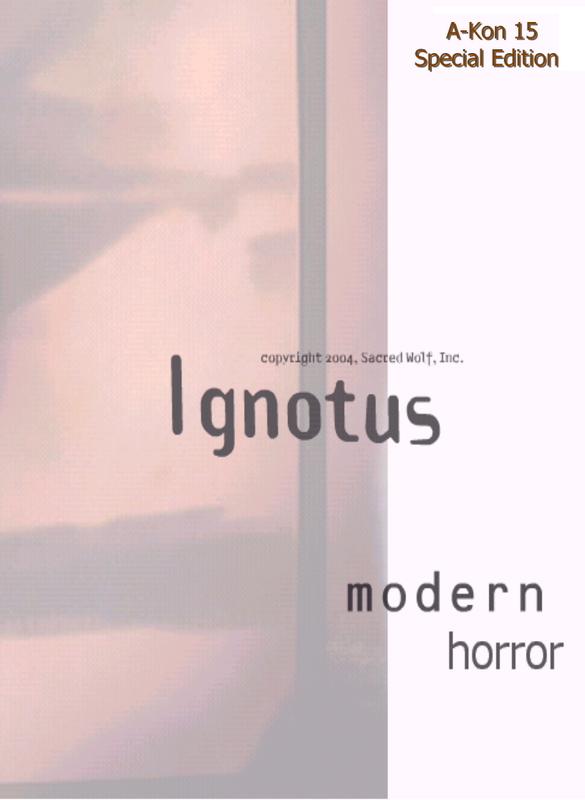 The first is the "Ignotus Halloween Special," which features three new, self-contained scenarios that can be played in one session-- perfect for Halloween! All the information you need to play the scenarios is there; they can be used as an introduction to "Ignotus," even if you don't have the rulebook. The first is based on a recent discovery under the streets of Paris-- a theater and restaurant carved out of the catacombs. (The scenario may be set anywhere, though.) Who built the theater, and why did they do it? What do the symbols painted on the ceiling and walls mean? Find out in "Cinema Veritas." The second scenario is a new look at the Headless Horseman, followed by the discovery of the inhabitants of a haunted house. Who will survive "Sleepy Hollow Revisited"? The third takes the characters on a train ride into a nightmare. After an attack on the train that leaves most of the passengers dead or trapped, the characters enter an old farmhouse, where they discover the secret of the former owner, and "The Chaos Engine." The other release is due on Halloween, Sacred Wolf, Inc's two-year anniversary! It's "The Best of 2004," packed with new rules and options for players and GMs! Over 70 pages of information, all of which is new and released under the OGL! General rules and additions to general d20, fantasy, modern, and future campaigns! This accessory will be a great addition to any d20 game! We're working with Politically Incorrect Games to bring Seipeal to the Iron Gauntlets game! It's a little different than the d20 adventure (it's closer to the original idea), and it features a bunch of new challenges and ways to use the Iron Gauntlets rules. A great addition for any Iron Gauntlets campaign. Part 1, "The Hidden Temple" has just been released at RPGNow.com-- check it out. It's being described as a "classic dungeon crawl," but it's different than most. The description at RPGNow.com says it all. Part 2 continues the story. The cult has developed and matured somewhat from its introduction in Part 1. It takes the characters into the outskirts of civilization, where they must confront the ancient religion as it pulls the human populace in. Parts 2 and 3 are currently in development. We've had a lot of positive responses to "The Hidden Temple" (and the Iron Gauntlets RPG has been getting good reviews). It's not the typical dungeon crawl. (From the introduction) "This book details how to play in a setting that promotes evil. To be the monster, instead of the hero, this is the place to make your start. That said, this is not a book detailing how to use monster races. There are already books about that. This book gives you a reason to play evil beyond what you would normally expect. "There are new races, new feats, new classes, new prestige classes, new spells… well, you get the idea. There’s plenty of new game information packed into these pages to make it worth reading. But there’s more than that. There’s a new idea. This book is based on the idea that there is no reason why a party of evil characters can not function well together and, in fact, better than a party of good characters. "So why evil? Well, for one thing, evil is fun. After all, this is a fantasy game, and if you played the good, law abiding citizens every time, how far is that removed from your every day life (let’s hope not too far). This gives you a chance to spread your creative wings and soar into new possibilities. Within these pages is the basis for an entirely new city, one founded on the ideals of darkness." You've seen the scenarios that allow the PCs to play the monster races for one session. You've read the sourcebooks for the monster races. Garath 'Nok goes beyond these. It sets up the basis for a different kind of campaign, where the PCs can play the monster races from start to finish. It's also a sourcebook for creating a city of evil creatures to use in an existing campaign. There are many ways to use this book, and incorporate the ideas into any d20 fantasy campaign. It's all new, unique, and a good change from your everyday campaign. Click here for a preview of Garath 'Nok! 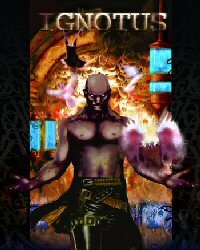 Garath 'Nok is available at RPGNow.com! "The younger gods-- our gods-- divided the world that once belonged to Riaghail and his followers after they won the war, millenia ago. Now, the allies of Riaghail want their lands returned. Is that any surprise to you?" Legions of reptilians, drow, and duergar have risen and attacked the outposts of civilization with a swift ferocity. A war is beginning that threatens to consume the world, as the followers of Riaghail (with humans, elves, dwarves, and gnomes among them) seek a return of the world that they were promised in the beginning. The priests of the younger gods, those of the humans and humanoids, have learned that the dimension where Riaghail, the ancient lord of serpents, is confined, is being opened by his followers and allies. There is one way to close the door between worlds, and seal Riaghail and his power away from his priests once more. Will the heroes be able to close the door in time? Requires the use of the Dungeons & Dragons, Third Edition Core Books, published by Wizards of the Coast, Inc. The d20 System version of "...Overworld" is now available! It features new rules for post-apocalyptic gaming (including radiation), new classes, metagenics and evolutions, and more detailed information on the cultures than offered in the Starter Pack. Expansion packs for the Active Exploits game system from Politically Incorrect Games are still in the works. The Off-Worlders pack is in the works, and will bring a bunch of other new stuff into the Slade Stevens' ...Overworld setting. The first supplement for the d20 version of Slade Stevens' ...Overworld is in the works. New cultures, feats, classes, and information on the colonies will be presented. Optional rules for 0-G environments and 3-D combat are included. This supplement will begin with a scenario for the central ...Overworld setting, so that it may be easily incorporated into an existing campaign. Limited print copies are available. Ignotus copyright 2004, Sacred Wolf, Inc.
'd20 System' and the d20 System logo are trademarks of Wizards of the Coast, Inc. in the United States and other countries and are used with permission.